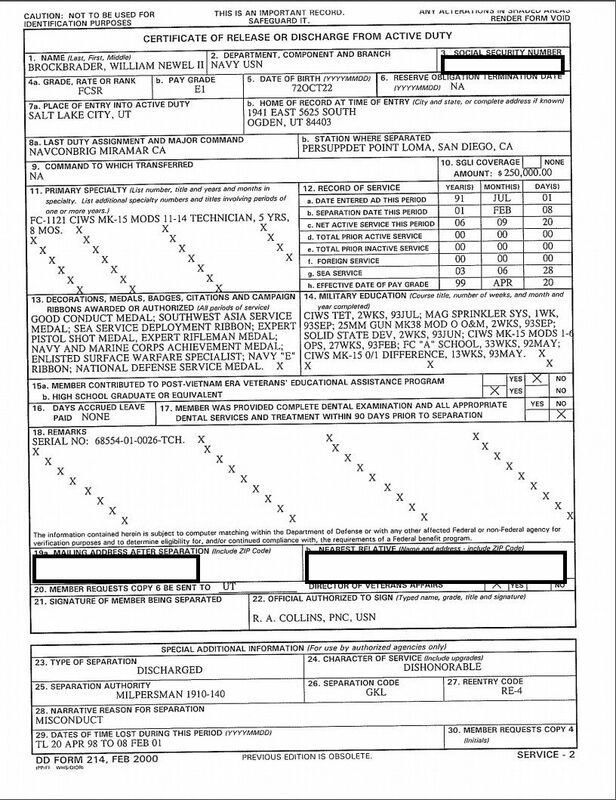 rental car warrant review File number 2018-001178. 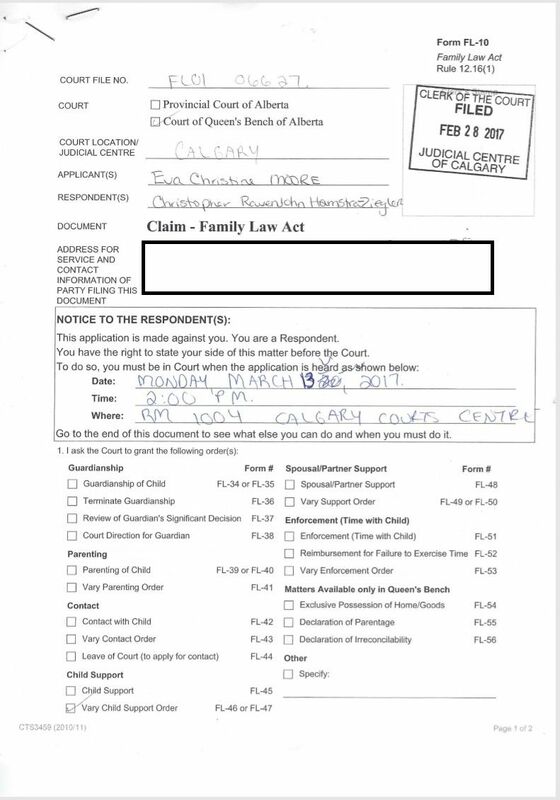 When it became clear to Stacy that I was not going to move to Edmonton because my son did not want to he called the police even though I was in constant contact with him and I did everything I said I needed to do. 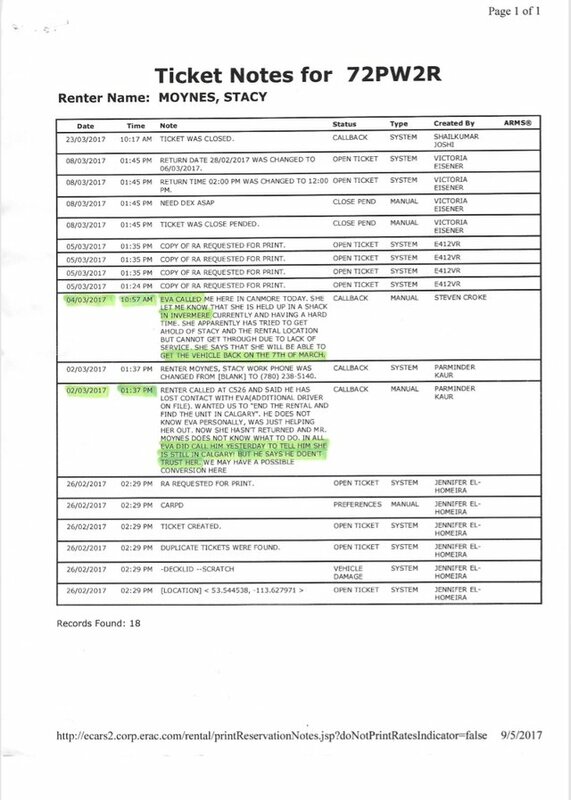 I do not feel this extension from Feb 28 to March 7 with constant contact with the rental company and the primary renter Stacy justified a need for a warrant ! I have not been able to secure work in my primary field of helping vulnerable people. This unjustified warrant has scared my son and my family. 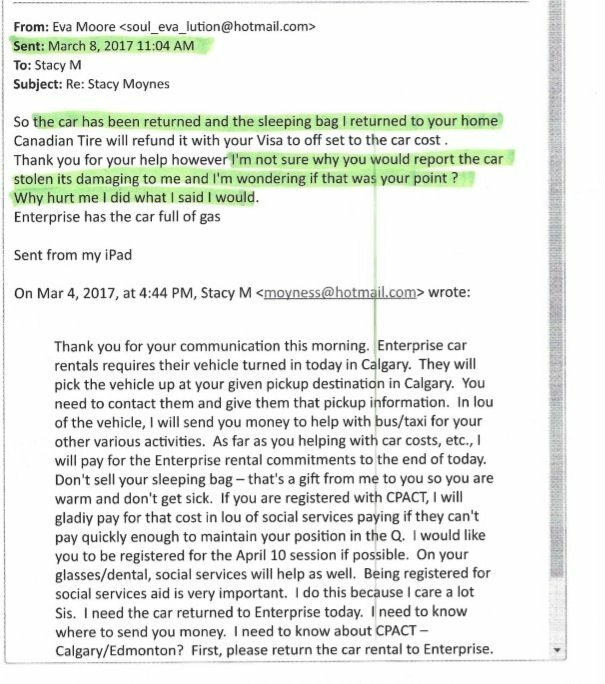 In 2016 I went to Edmonton after returning from Calgary where my car was missing and my belongings had been removed and left in the snow. 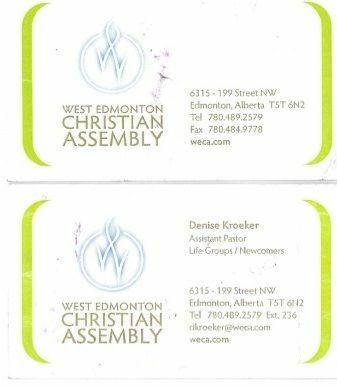 I was training for work at West Edmonton Mall when I saw they had a non denominational chapel and would go there and pray and speak to the staff about the concerns I was having with my family and they would pray with me. They informed me they had a parent Pentecostal church that had regular services. I went and spoke with the Pastor Denise Kroeker about the issues I was having with my family in Canada and that they did not want me to remain married to my Husband whom had been reported missing and an American Navy Seal. Diane was very kind and spent time with me and prayed with me and on one service I was beside a man who presented himself as a RCMP officer and that he could help me. We went for Coffee and then decided to continue meeting up and he was kind to listen to my story and review as much detail as possible regarding my Husbands complex case. 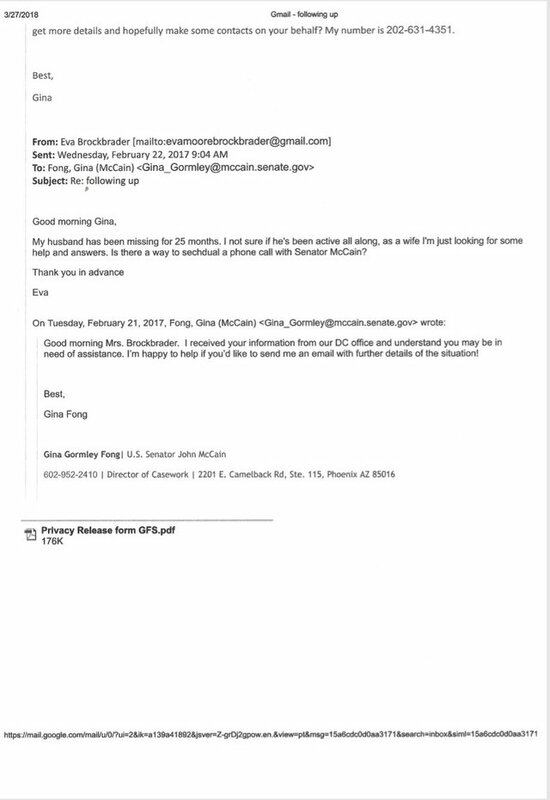 After listening he suggested I contact Senator John McCain's office. I did so. 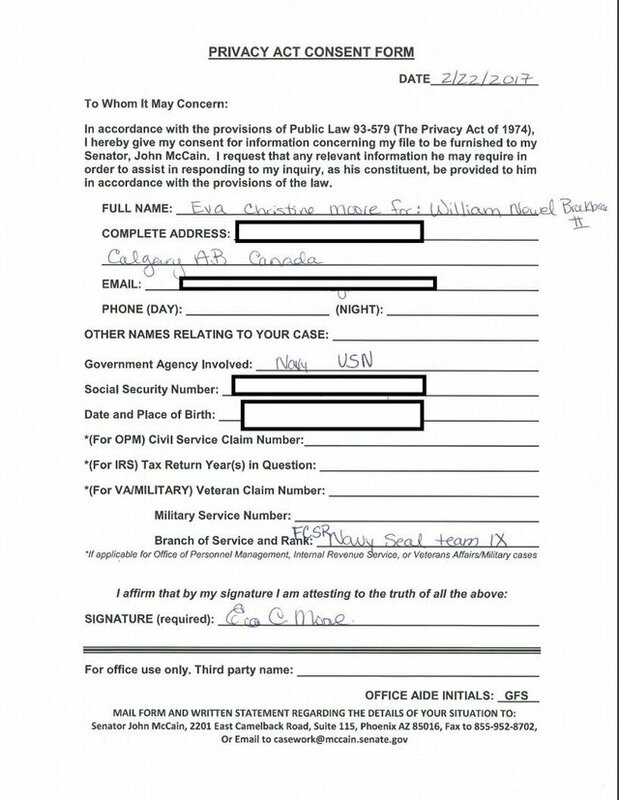 I was asked to provide information and did so as well as signing a privacy release document. I did so. Stacy was very kind he really tried to listen to all the complex details and did his best to asses how to help me. I mentioned there was strange things that had happened at Christmas and that my car had gone missing and my belongings were left in the snow on my sisters lawn and I needed to retrieve them and store them properly. Stacy got upset when I told him I was leaving for Calgary to go see my Dr and to remedy the issues with my belongings. We had a heated conversation in the lobby of the Church and 2 elderly people concerned with the situation came and sat beside us to try and witness what was happening. 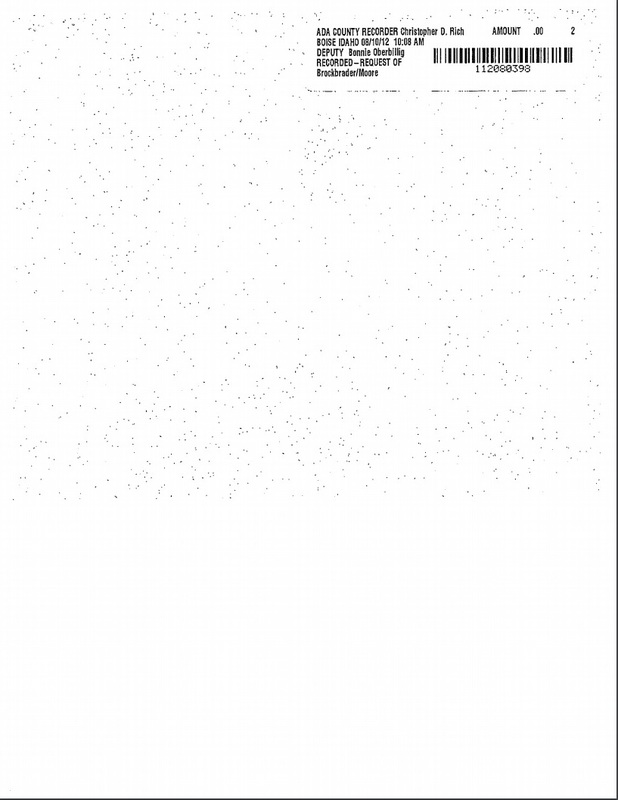 I did not feel safe anymore. It became clear to Stacy that I was going and he offered to help rent a car and that was very kind. Once the car was rented and I was on my way to take care of many things I also had a conversation with my son whom was at university and mentioned there was a 3 month Electrician certification through the Union and it would be beneficial for both of us to have a trade. My son confided in me he was not interested in living and Edmonton but would be willing to look at a program in Calgary. 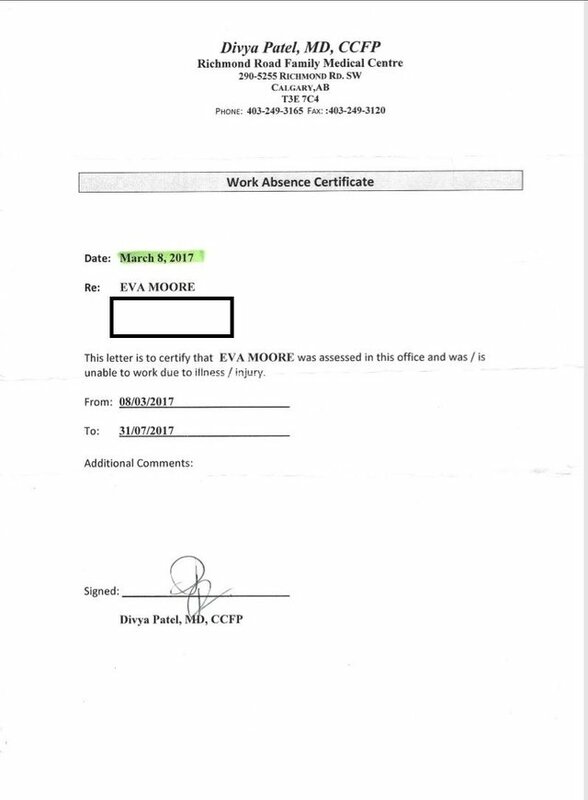 Once I arrived in Calgary I went to the employment center to apply for EI/ short term social services/ disability because of my injuries from a car crash in the USA and as I was in need of some help even though I had been working 2 part time jobs. I contacted my job foreman and asked him if his basement suit was available for renting. He mentioned that he had renters but that they used it for storage not for living as they were both working up north at a camp. He would contact them and see if they were open to me renting and splinting the rental cost. In the mean time he was ok with me moving my stuff to his garage till we heard back and I did so quickly. They were leaving to their cabin and could not agree to leave me in the space with out the renters permission. They invited me to join them while we waited to hear back so I did not have to sleep in the Car. I did contact the rental company and Stacy to let them both know I had to extend the rental as my Dr was unable to see me until Monday and I was filing for short term disability and this was key. 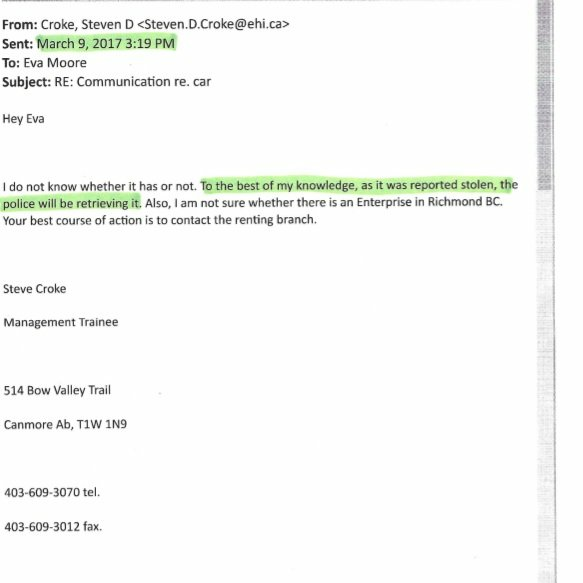 I also told them that I had been invited to Invermere with a potential land lord and would be out of cell service. My belongings were still very frozen and it took a lot of time to hammer at the ice in order to remove them and I was only able to move a small amount before they were leaving for their cabin. 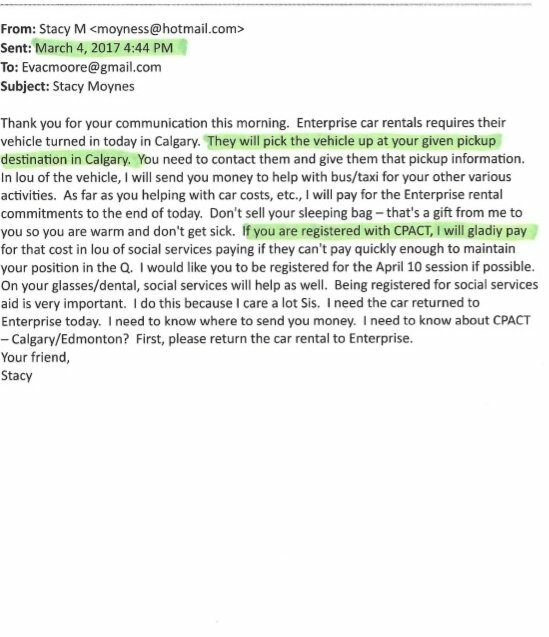 I called Stacy to let him know the update that I had applied for the Union certification In Edmonton and benefits in Calgary and found a potential space to rent as my son was not willing to move to Edmonton. 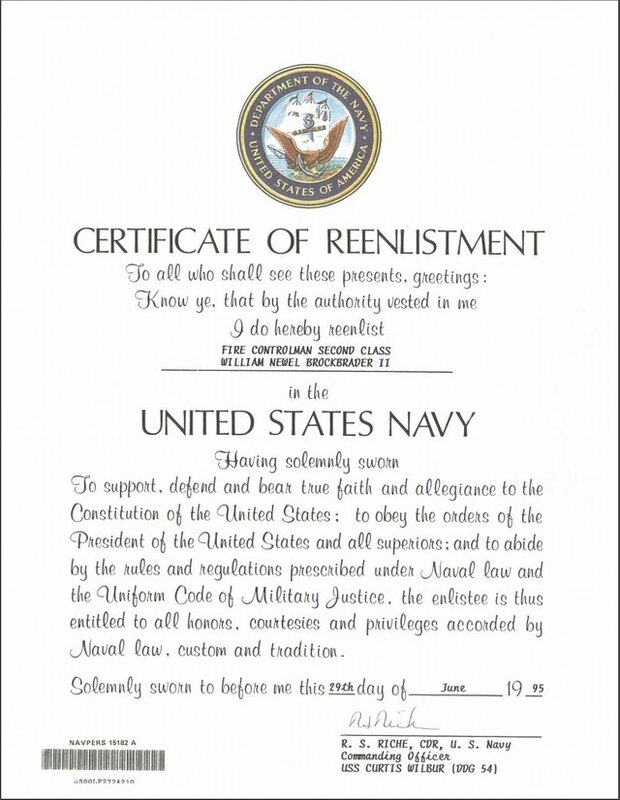 That I was still willing to come to Edmonton as he suggested for the certification but that my son was priority 1 and so I was not going to relocate to Edmonton. Stacy was very upset at this news I was going to stay in Calgary. I think he hung up on me. I continued to try to contact him by email as I was not always in Wifi and using Skype and email for communications. I DID let the rental agency know and I did let Stacy know my plans and ensured that everyone was on the same page. The rental company agreed and said it was not a problem. 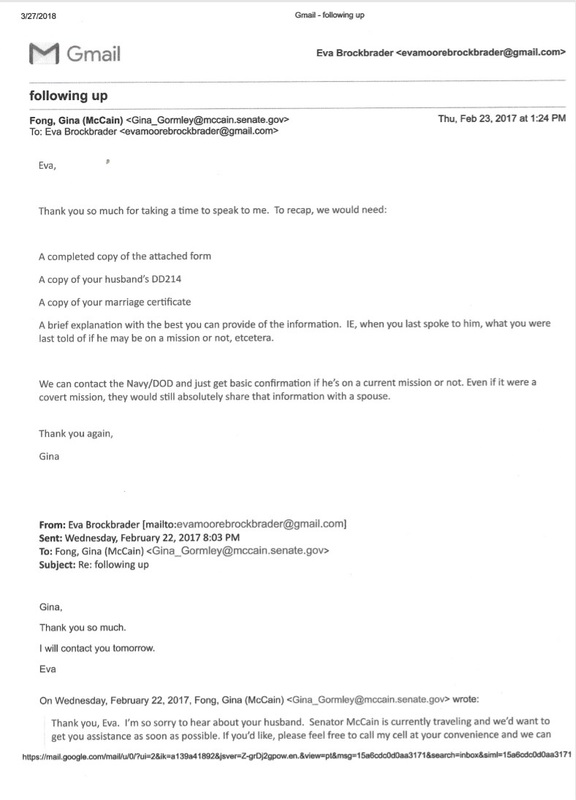 I notified Enterprise I needed more time by email as I wanted to ensure a paper trail after he hung up on me. See below I requested extra time while waiting to hear about the rooms for rent for my son and invited to the cabin so I did not have to sleep in a car. I then called the closet location and wanted to make sure they were ok with an exstention of time. 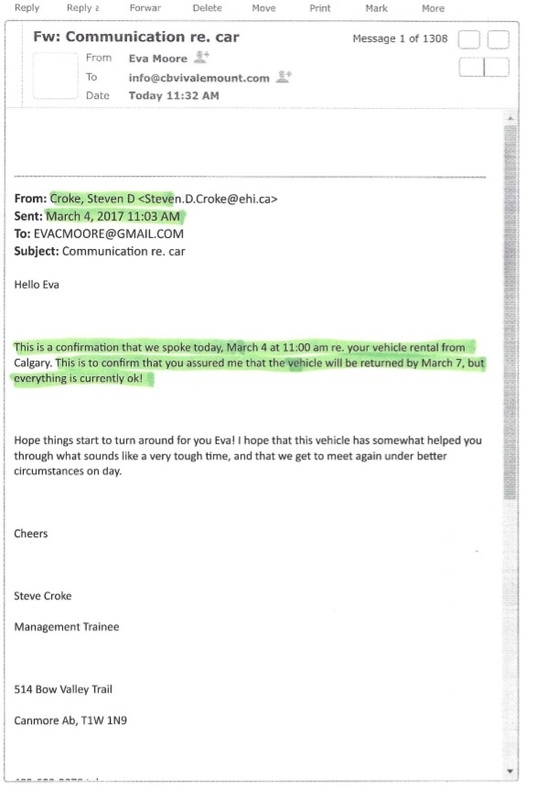 See below their confirmation that I would return the car on March 7 2017 as I did do. I feel that Stacy acted out of a desire to control things and his desire to control where I was living was about his ability to control me. My priority has been my son and when I asked my son where he wanted to live he refused moving to Edmonton and so I proceeded to follow through with Stacy's suggestions however, I proceeded in Calgary in stead of Edmonton. Stacy not liking he was losing control called for an arrest warrant. 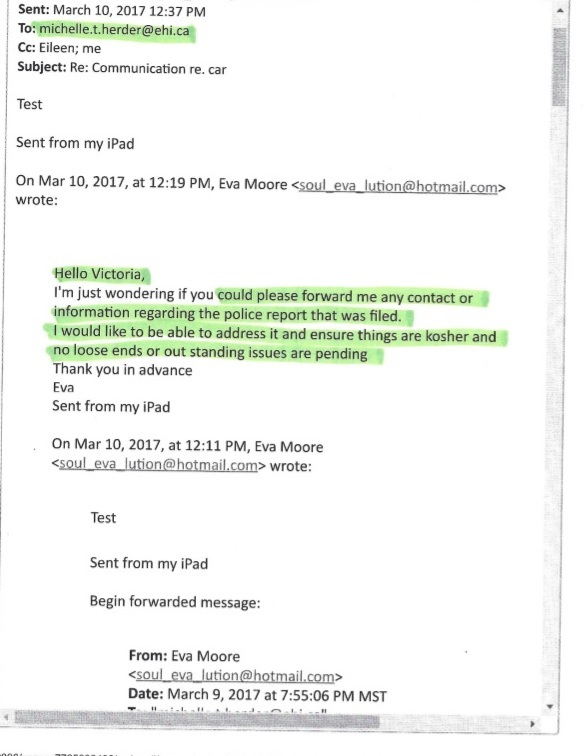 I am not sure if this matter went before a Judge and evidence was presented or if Stacy had friends at the Devon dispatch that he called for a favor. On September 2, 2017 after a trip to Washington DC I tried to cross in to Vancouver by way of Seattle with a friend by car. I was notified that there was an outstanding warrant that I was unaware of issued out of Devon re a stolen rental car. 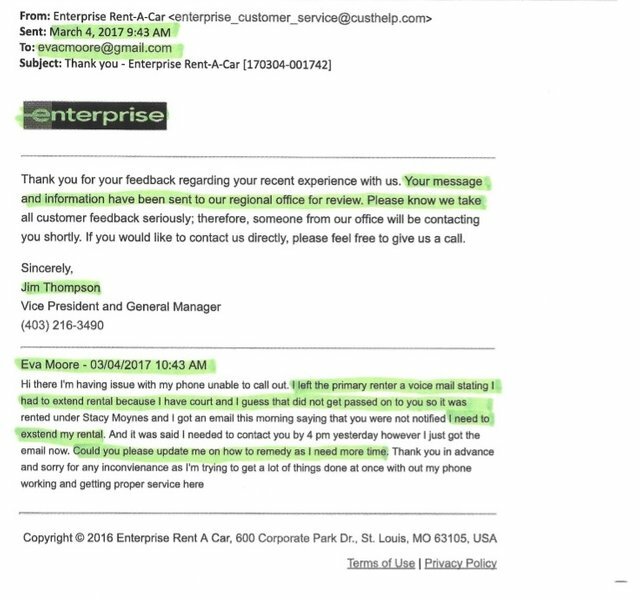 I was shocked as I had contacted the Enterprise by email and had confirmed the rental was returned safe with no outstanding problems. If the Car was returned and the rental company did not have any issues why was this still showing as stolen?? 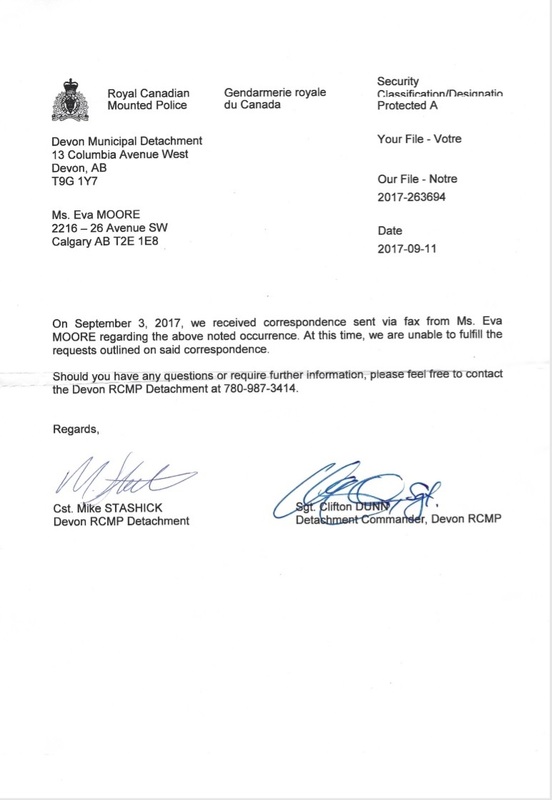 I contacted the clerk of the court and asked if a copy of the warrant could be sent to me to review and I was asked to contact the investigating officer Cst Stashick. 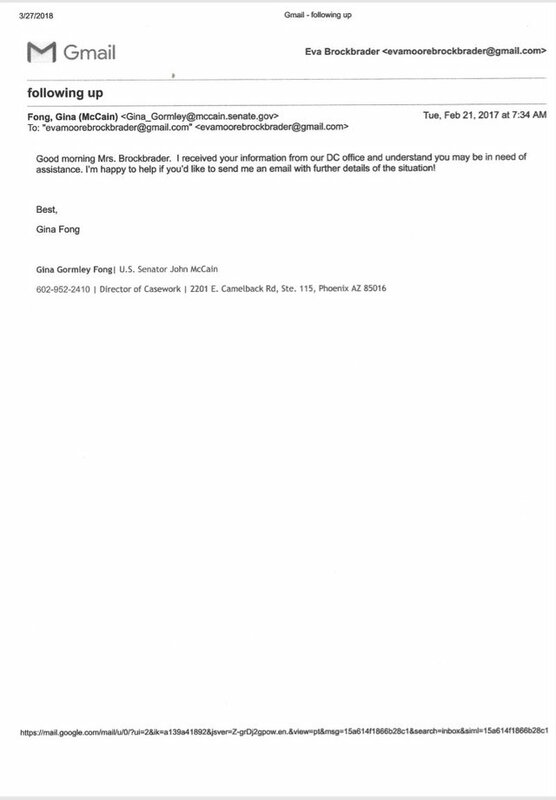 I promptly faxed him a copy of the Enterprise internal communications as evidence that the car was in fact returned that they did not have any issue and that I had been in contact with Stacy and the rental company and kept my word to return the car. See below Enterprises internal office notes. I went to see my Dr on the weekend this is where the rental car was parked for pick up off Richmond Road. 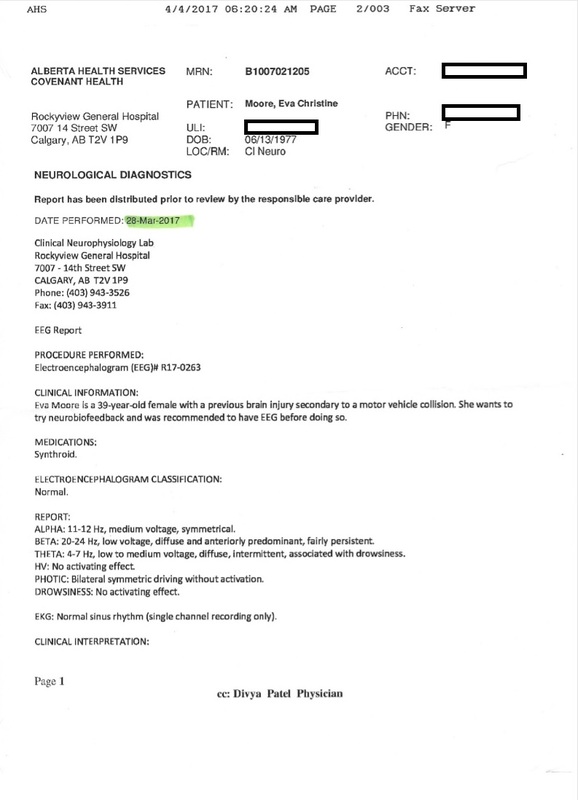 I had to request an EEG for my application for my Disability that i was preparing for. 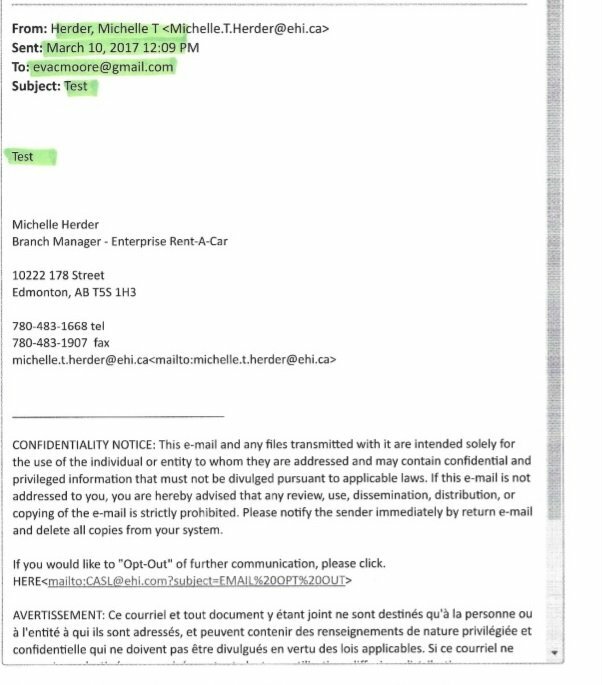 Both of the below documnets are ref my appoint March 7 2017 when I dropped the car in my Dr parking lot and alerted Enterprise I had finished my errands. I went back for another appointment the next day and noticed the car was still in the parking lot. I was told this is standard if the police have been called. 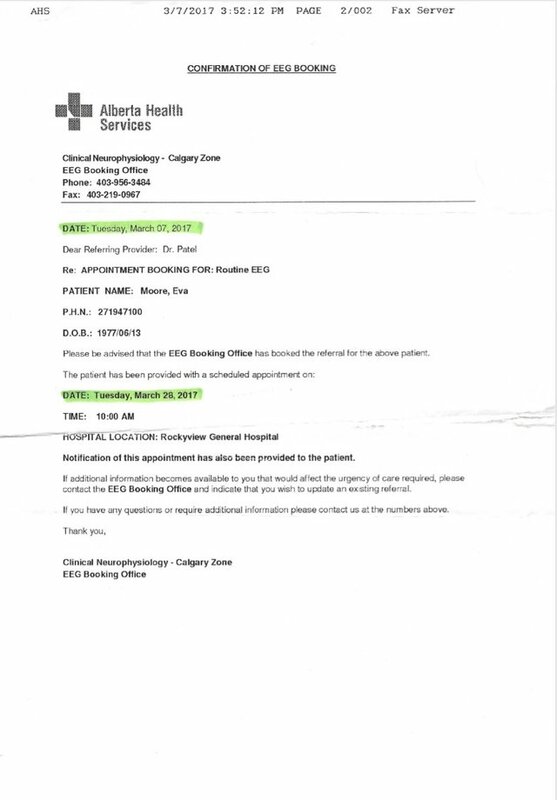 I did go to court and spent all day there Feb 28 and again March 1 2017 I still had to go to see my Dr.
Below is the letter I got back from Service Canada after my EEG re my application for short term disability. 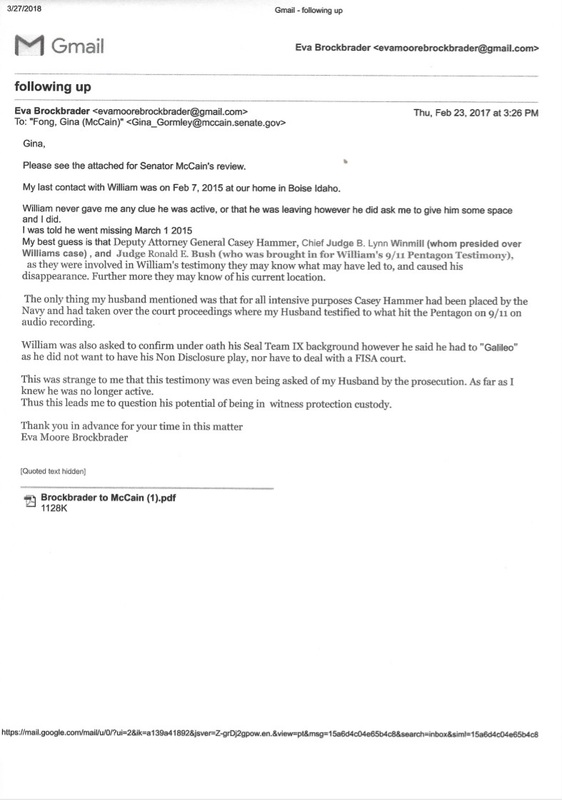 That Stacy had remarked he just "did not trust me" I do not feel is grounds for a Warrant when I did everything I said I was going to do and followed through. 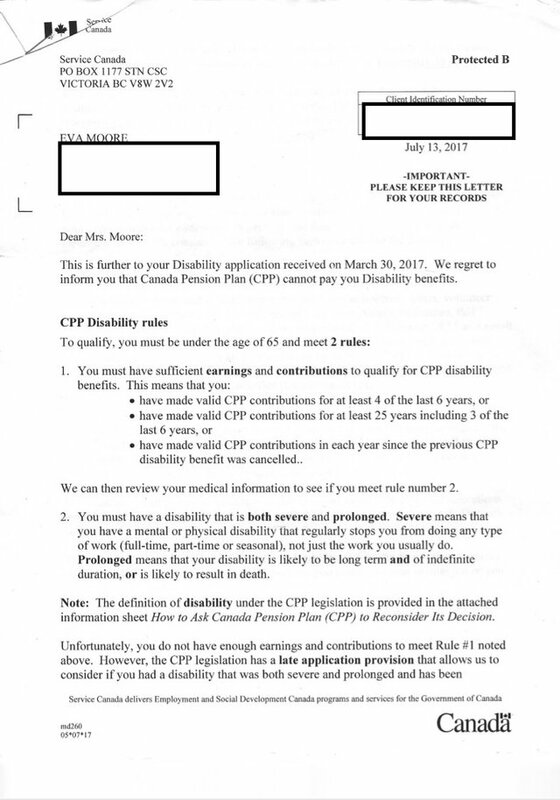 The only thing that changed was my sons willingness to move to Edmonton and this was out of my hands however I was still willing to attend the APCT electrician certification as he said. I was not lying or hiding anything from him or the rental agency. 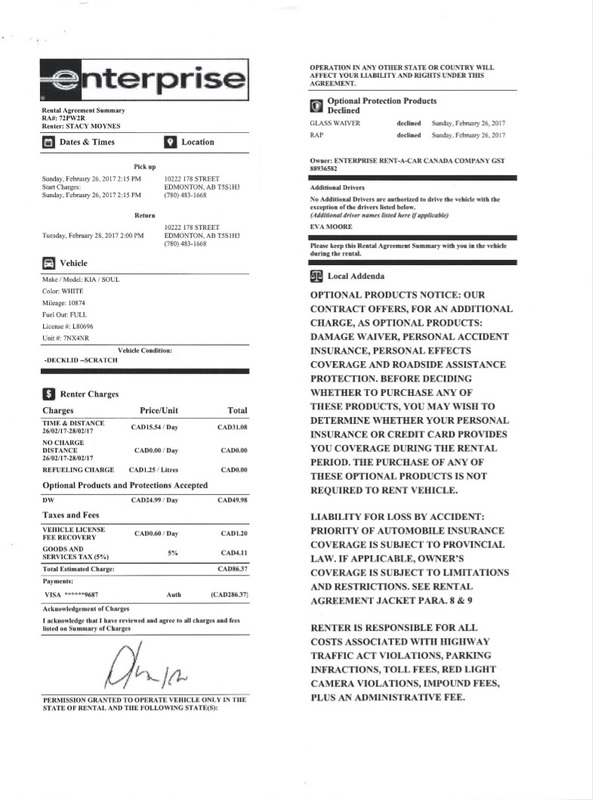 so I felt that since the car had been returned that a warrant was not necessary and that if someone does not trust someone its not grounds for a warrant to be issued and destroy my ability to get work and feel safe. 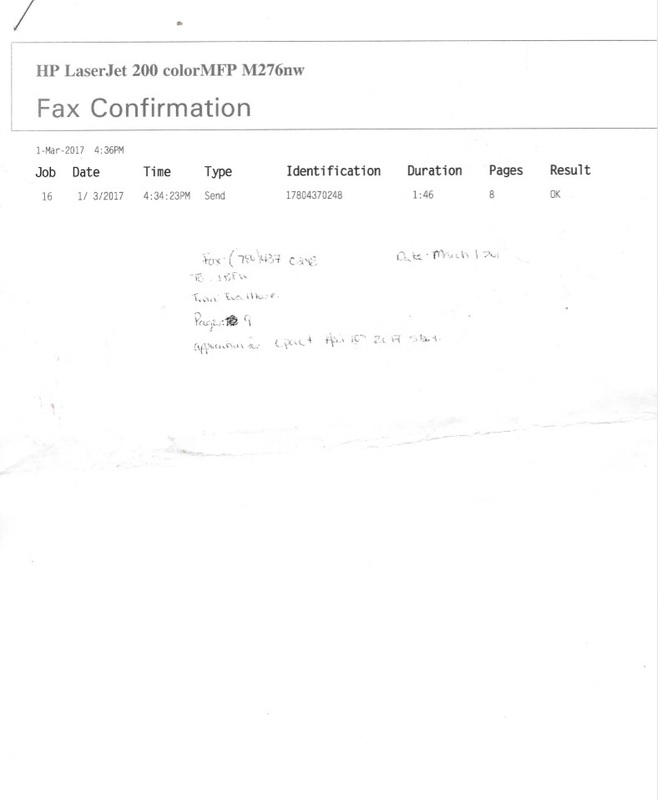 In the fax I asked that he Pull forward the warrant and vacate the order as there is proof in the communications that a warrant should not have been issued at all. I have applied for jobs in my line of work being helping people who are vulnerable and I know that these jobs require a back ground check. 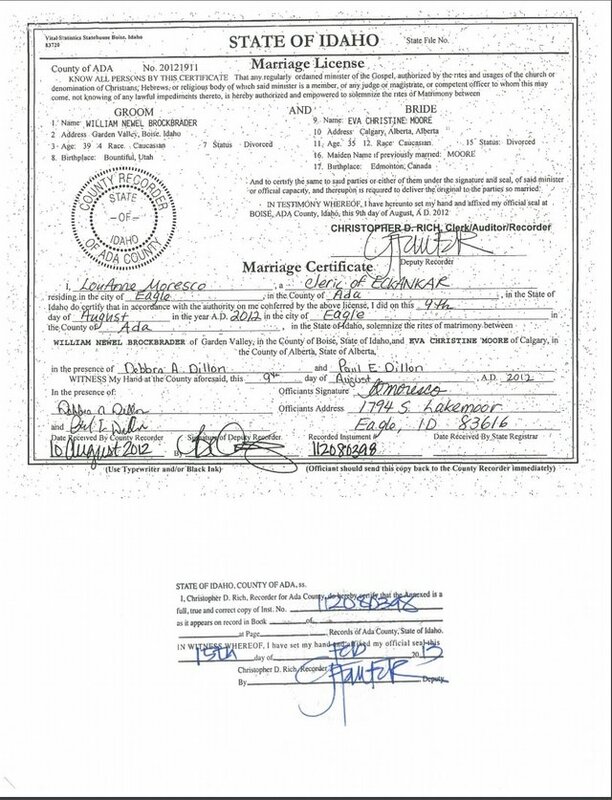 I know that they will see this warrant however it is only proof that I am not ok with the lies and slander. I want these company's who investigate to investigate. This is abuse. I received this letter back from the Devon Dispatch. I called today March 27 2018 and spoke with Commander Dunn who was very kind. He mentioned that he was not familiar with the case and would have to refer back to the investigating officer as he signs off on a lot of letters. 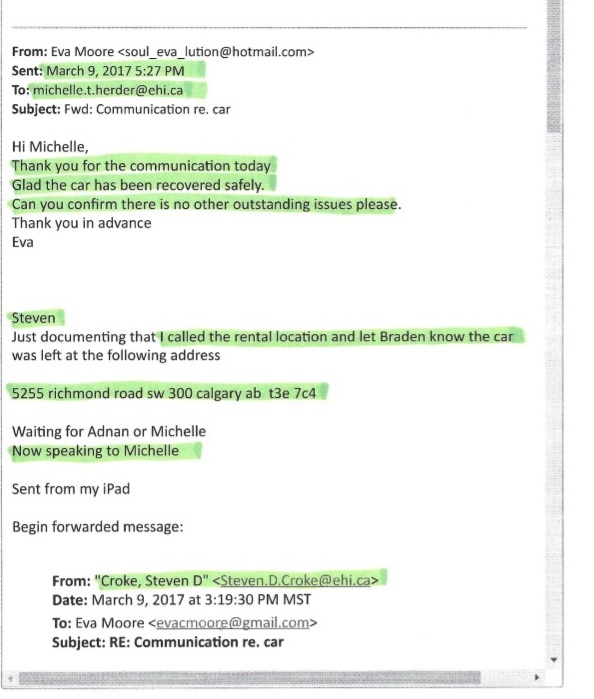 I did my best to review that the warrant seems to be silly in that when the notes from the rental office are reviewed the date the car was to be dropped off that I arranged I kept and that there was a full tank and no issue with the car. 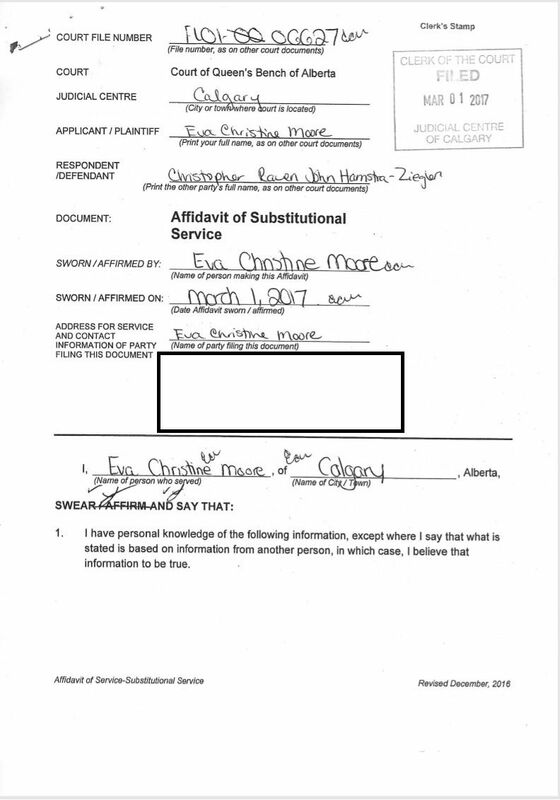 I feel this is important to keep in the for front the warrant was not issued by the rental company. Was this warrant going to stand? Did a judge even review the case? Based on what evidence? Stacy saying he did not trust me? 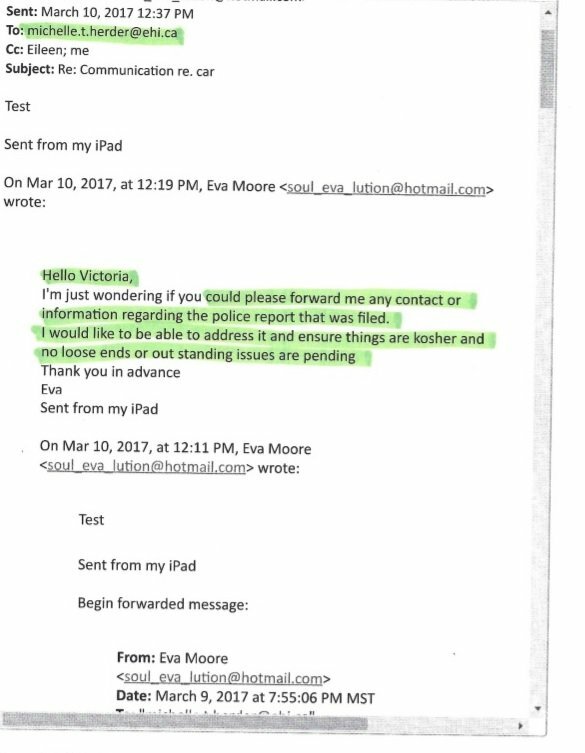 The rental company said this was unusual as it takes weeks to months with no communication before they would ever issue the warrant. 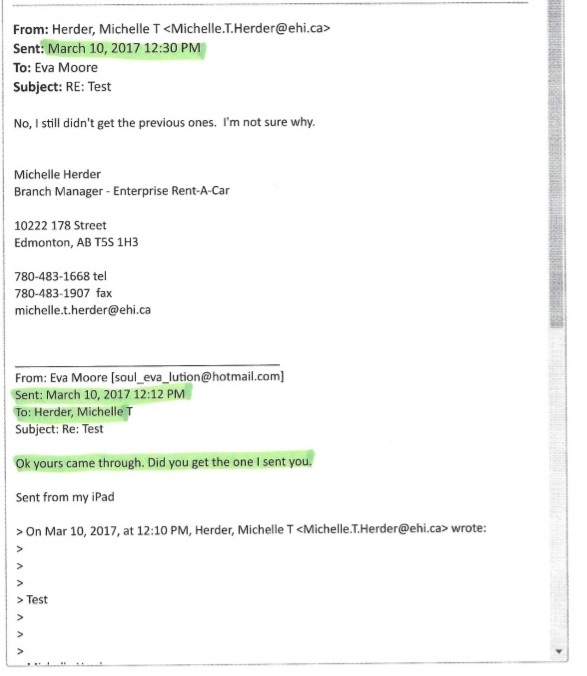 Below is the email I sent to Stacy after I confirmed with Enterprise that the Car was safe and there were no outstanding issues. I never got a response.